First up was the great Tommy Lee Wallace. 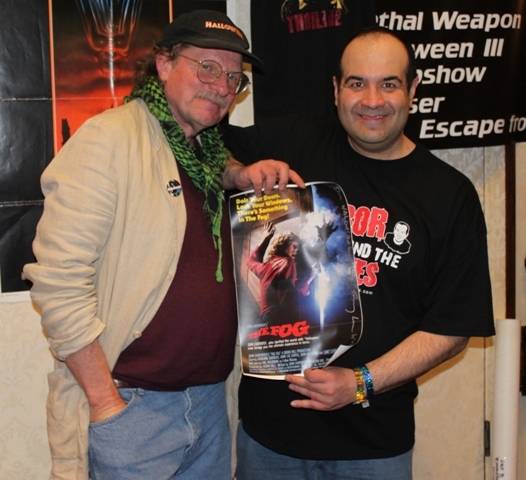 Wallace served as John Carpenter’s production designer and co-editor for both the original HALLOWEEN as well as THE FOG. Wallace, himself, would later assume the director’s chair for HALLOWEEN III. This film was being given a special Horrorhound salute – also being tied in with this year’s MASKFEST. As most horror fans are aware, HALLOWEEN III: SEASON OF THE WITCH broke rank from its slasher franchise by dropping Michael Myers in favor of a completely unique storyline featuring a sinister warlock and his diabolical plans to turn America’s trick-or-treaters into bug infested corpses. He would accomplish this with the assistance of his Silver Shamrock masks – producing one of the catchiest, fictional TV ads of all time. 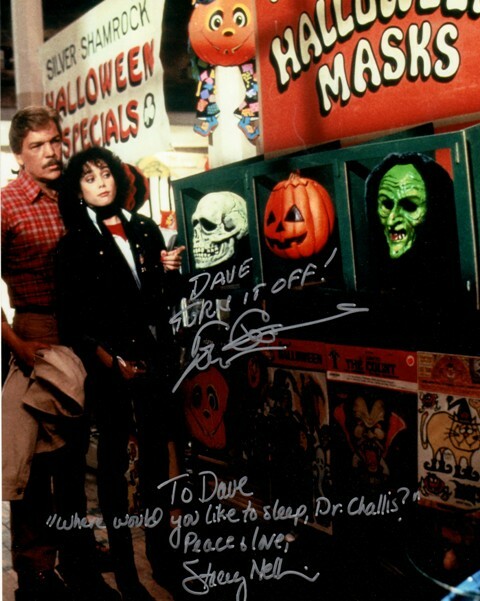 As an 80’s slasher fan, I (and many others at the time) weren’t pleased with this breach of HALLOWEEN protocol. Looking back, however, I have gained a much better appreciation for it. 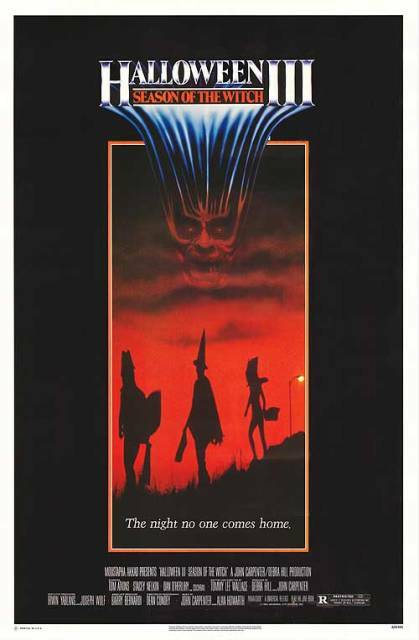 The film is unique and, in many ways, a more fitting tribute to the “Halloween” holiday than any of the other entries. 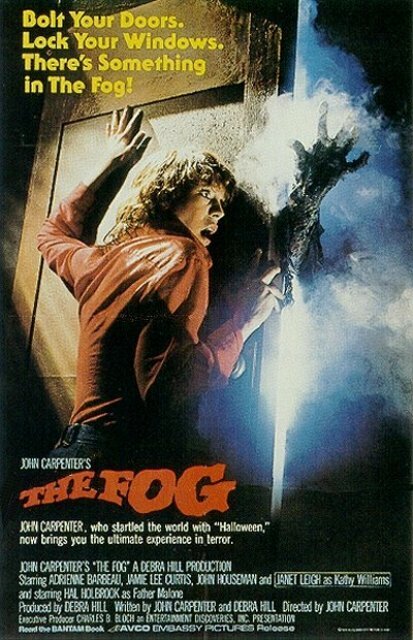 Regardless, it was a poster of HALLOWEEN & THE FOG that I opted to have Wallace sign. Wallace was friendly and seemed to appreciate the praise I gave him regarding his work in THE FOG. Of course I really wanted to ask him about his ex-wife, Nancy Loomis, who played Laurie’s feisty friend, “Annie,” in Carpenter’s HALLOWEEN. She was always one of my favorite characters and I wanted to find out if she ever made rounds in the convention circuit (like P.J. Soles). I chose not too, figuring it might be stretching the boundaries of good taste, and the last thing I wanted was Wallace getting offended and folding my posters into paper airplanes. Although I didn’t mention it in my “Celebrity Encounter” blog a few weeks back, I’m going to suggest that asking celebrities about their personal life is a no-no. 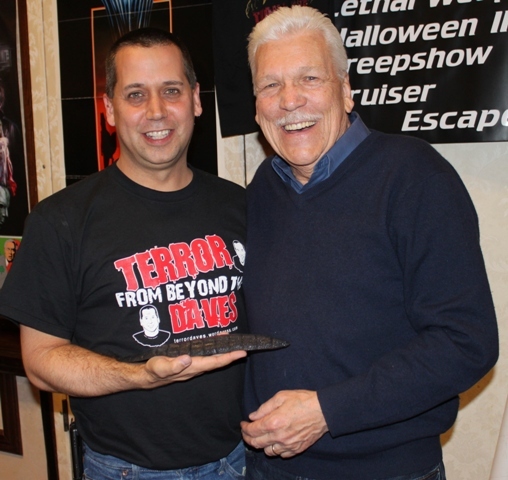 I have to go on record and say that my favorite celebrity at Horrorhound was Tom Atkins! He was an absolute hoot, and definitely worth meeting (in our case twice). I walked up to him and asked him a question that had been posed to him during THE FOG. It was a bit of a risk as actors aren’t always familiar with their past roles, let alone one filmed over 30 years ago. We all laughed as I said, “Thank GOD your weird,” and had him sign both a poster of THE FOG as well as one of his own photos. He happily allowed us to pose with a replica of a “creep” from NIGHT OF THE CREEPS – another fun horror film from the 1980’s. The black, slug-like creature, famous for animating the dead, was sitting on his table and perfect for a photo op. 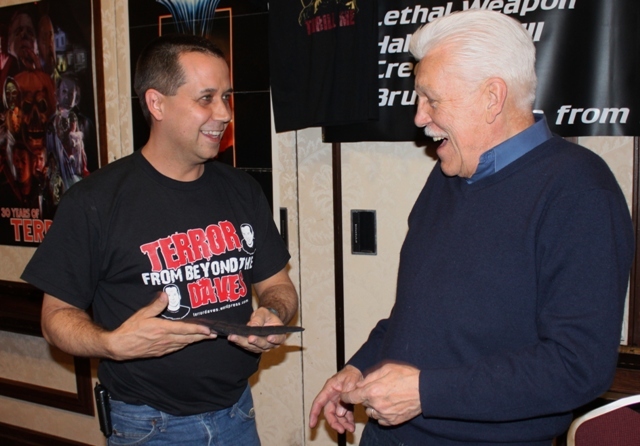 He got a kick out of our TERROR FROM BEYOND THE DAVES shirts and, throughout the weekend, whenever we walked past his table he’d smile and yell – “Look! There’s a Dave!” Atkins had some amusing shirts of his own for sale and David picked one up for Richard, our young computer wiz kid! 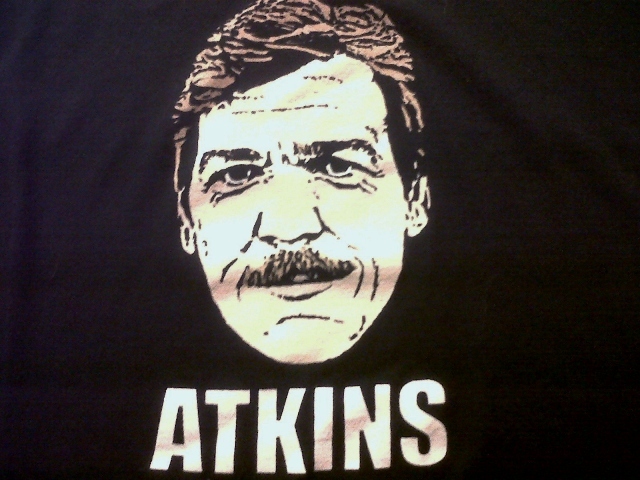 Atkins gets a “10” on the TFBTD celebrity Meeting Scale for having lots of enthusiasm, genuinely making the fans feel special, offering his own props for photos, and for selling hilarious shirts. 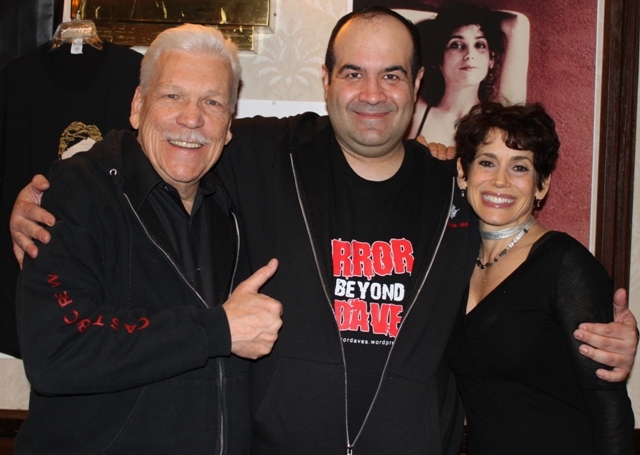 I was so pleased with our Friday meeting, we ended up paying him another visit on Sunday – this time I had him sign a HALLOWEEN III still and pose with co-star, Stacey Nelkin. MASKFEST paid tribute to another iconic 80’s film, KILLER KLOWNS FROM OUTER SPACE, and we’ll be covering that in greater detail soon, along with even more celebs. But first, a quick visit to the Horror Host Room….. 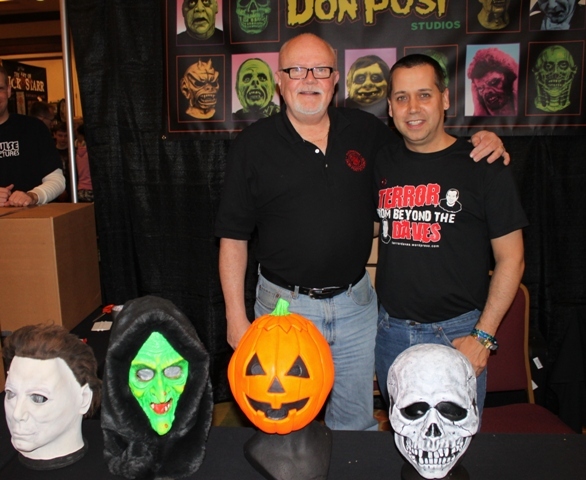 This entry was posted in Big 80's Horror!, Celebrity Encounters!, Convention & Expos and tagged Don Post, Don Post Masks, HALLOWEEN III: SEASON OF THE WITCH, HORRORHOUND WEEKEND, Jamie Lee Curtis, NIGHT OF THE CREEPS, Silver Shamrock Masks, STACEY NELKIN, The Fog, TOM ATKINS, TOMMY LEE WALLACE. Bookmark the permalink. 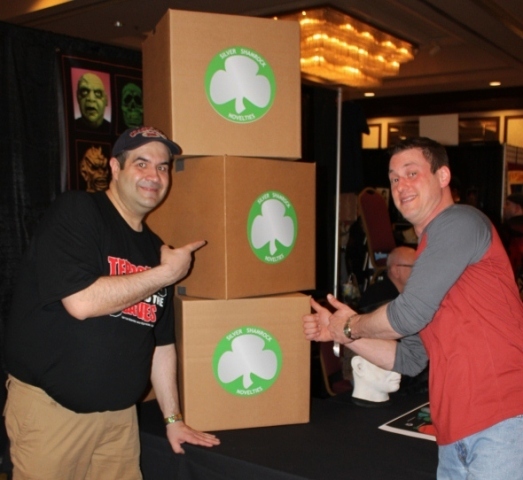 ← Bumming a Cigarette from Corey Feldman & other Crazy Moments at Horrorhound Weekend! Thanks for your comments, Jacob! We Daves agree, SEASON OF THE WITCH deserves some recognition! Halloween III is the best of the sequels. I will be watching it again in 20 days! 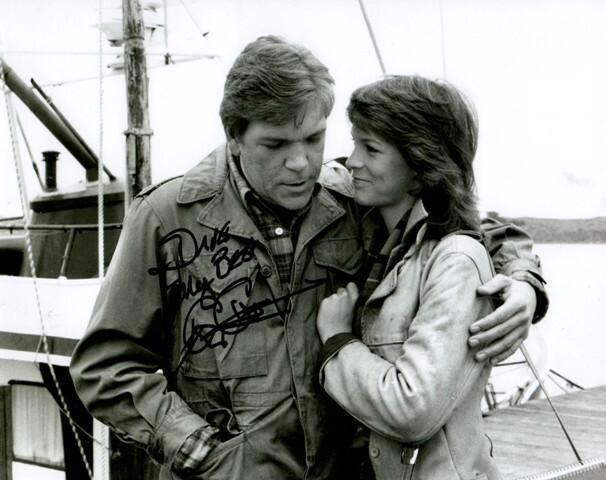 Wonderful pics, Atkins is a great actor. Thanks, Lee, and we couldn’t agree more! I’d definitely like to meet him again he was a real character and very fan-friendly.